Ok, as for cleaning, its not completely done and I can only do so much before the dust really gets to me but its starting to look really nice. I will be adding better pictures to an animal page sometime in the near future. Anyway that means the bunnies have to move. . . . There is room in the barn but its not an enclosed space like the stall. The problem with that is in the winter what to do about their water freezing. If my measurements are correct there is enough room for 16 large hutches and 2-4 smaller hutches. There is also room for their feed barrels. Another idea is to build a Rabbit Barn off of the existing barn. There's a small area near the chicken pen/stall that already has a door. We would just have to build 3 walls and a celling. I believe the area is smaller then the one inside the barn. I'll be measuring it today so I'll know for sure. 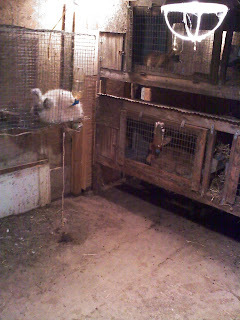 rain collection to feed into an automatic watering system - this would need a filter, read about an automatic watering system in Storey's Guide to Raising Rabbits. I wonder if putting a heater into the main bucket would keep the lines from freezing in the winter? rabbit run - I would like a rabbit run that can be folded up and put away. Preferably outside, with shade and plenty of grass. Panels attached to the side of the barn might work. Maybe with a roof, also attached to the barn, that folds down? If I made the run long I might be able to connect it to the sheep pen. With a little work on the fences it would be a huge area for the rabbits to play in. There would be no roof though, and I couldn't watch the whole area all at once. Some of these things would interfere with other ideas I've had, so nothing is set in stone yet. If anybody reads this your comments would be appreciated. This is my first time managing our rabbit herd pretty much on my own. Constructive criticism / comments will always be read/considered and I will do my best to reply to everyone.